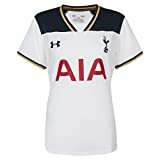 The Under Armour Tottenham Hotspur 2016/17 Womens Home shirt is worn by the Players from White Hart Lane in the 2016/17 Premier League Football Season. Made with an exceptional material construction that truly tasts the 90 minutes. A Fitted design that lies Next-to-skin without the squeeze of a compression baselayer, the Tottenham Hotspur Home Shirts fabric constuction is incredibly light, super soft and wicks sweat to keep you cooler with the added Moisture Transport System, added Anti-odour technology prevents the growth of odour-causing microbes and Team details including club badge and team crests to hem. This entry was posted in Soccer and tagged 201617, Armour, Football, Home, Hotspur, Shirt, Tottenham, Under, White, Women'S by FPSports. Bookmark the permalink.